In this era of the internet, how will you feel if one-day mailman arrives to deliver you a handwritten letter? You will be surprised and eager to read it. 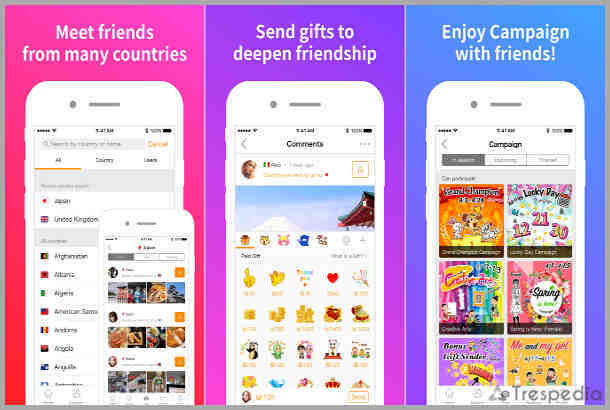 Here we have organized the best pen pal apps which will bring the traditional pen friend experience to your smartphone. These apps will let you make a new pen pals from all across the globe. You can make friends according to your interests, hobbies, language, age group, etc. There are lots of social media and pen pal apps for Android and iOS. We are listing top 15 from them which allows you to make new pen pals and start a conversation with them. In the time where no one even thinks about writing a letter, these apps will bring that experience back to life again. Show your creativity and writing skills in a single letter and start making life long pen pals internationally. Pen Pals is one of the best pen pal apps for Android and iOS users. You will meet new people from around the world with this app around the world. 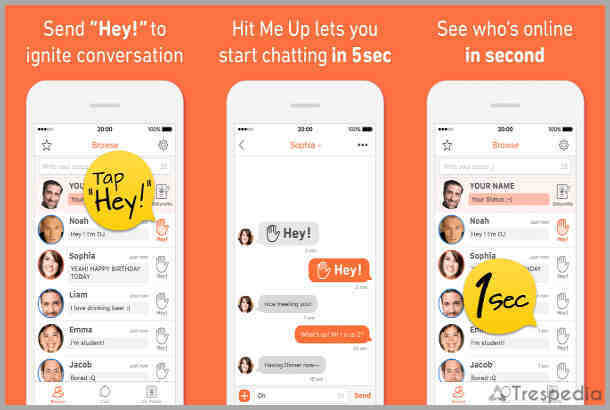 You can quickly start to chat with a stranger using this app. All you have to do is to write a letter and send it. Your letter will travel to different Pen Pals users across the world, and if anyone likes what you wrote, they will reply. You can directly interact with people and chat with them to understand them better. Add them as a friend for future conversations. Collect stamps and get rewarded by completing different tasks in the app. Learn the culture of your new companion and recognise people from other countries like UK, Germany, Canada, China, etc. The best thing about the app is it’s completely free and ad-free. Start chatting right away by downloading the app from the below links. Slowly is another popular pen pal app which allows you to write a letter to the world. It is a great pen pal app by which you can quickly meet pen friends from your smartphone. Find a pen pal or friends according to your passion, language, and interest. Write a letter and collect stamps from around the world. You can send one letter at a time to a person and time of delivery is dependent on the distance of the person (just like a real letter). The farther the person lives from you, longer the letter takes time to travel. You also have the options to block certain countries or people if you wanted to. For those who have considered making pen pals, this is a great app to help that craving. Bottled is an excellent pen pal app for Android and iOS users. It allows you to meet strangers, chat and learn new languages. 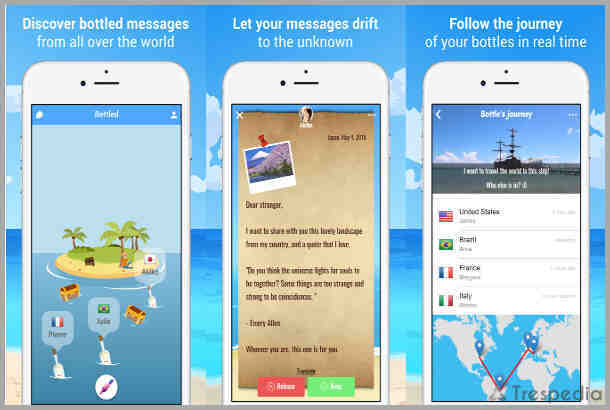 The app is a modern version of sending a message in a Bottle, which is a new way to meet people. In the app, you get a private island from which you are communicating with the world using bottles. It is a free and secure app which allows you to start a private chat with strangers. All you have to do is to write a letter, put it inside a bottle and send it. The bottle circulates all around the world to different users. If someone likes it, you will get notified and start chatting with the person. You also receive bottles from different users, but the frequency is very less. You can increase the frequency of bottles by using a booster. It has the option to keep message by recipients depending on the content of your Bottled message. You can also filter so that bottle should be delivered to a specific gender, country or language. Lettrs is a great, unique and different pen pal app. It let you discover and meet new people in its unique style of letters. Add images, signatures, texts, and you can make it just like a real letter with graphics. There are tons of great paper styles and stamps. You can communicate with different pen pals across the globe. Easily translate letters to experience an international community of powerful voices. 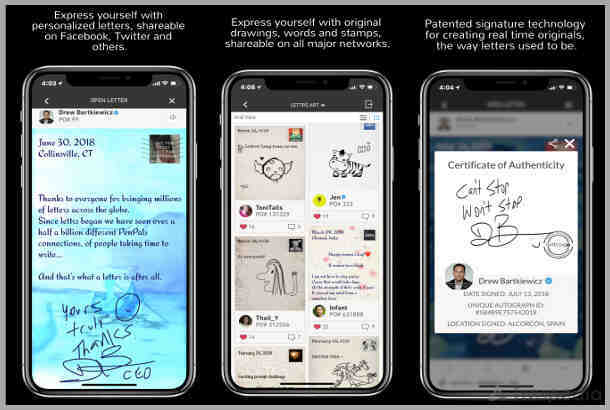 You can also explore autographed messages authentically from your favourite celebrities such as Andrew Wiggins, Jordan Clarkson, Paulo Coelho, Izabella Miko & Michelle Phan. Lettrs patented collectible, verified, and autographed messages to fans in the year of 2016. It is also the official fanmail app for Major League Baseball Players Association. App also allows you to edit the open delivered letter if you forgot to something add. Download the app and instantly connect with international pay pals by sending a letter. Paltalk is another popular pen pal app which allows you to start to find pen friends around the world quickly. 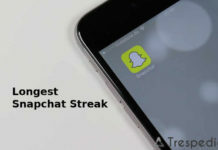 You can also use it to start a group video chat with your friends. Paltalk has different chat rooms that you can join based on your interest. After joining a group, you can have a conversation with anyone. You can message directly to complete group or start a chat with a specific person from the group. You also video chat with other users, but this functionality is limited to your subscription plan. In a free plan, you get to visit the rooms and have audio and text chats with limited features. Paltalk have different chat rooms just like Reddit having different subreddits. You can joint group based on music, politics, sports, and more. It’s easy to find new friends and start a chat with them using this app as there are real people instead of bots. 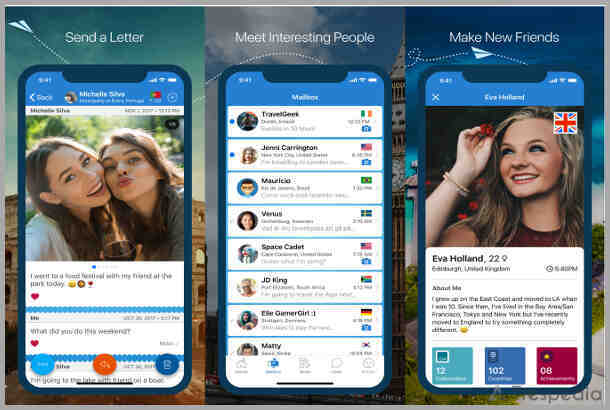 This app is one of the best apps for making international pen pals. Subscriptions are starting from $4/month for full access to features and an ad-free experience. HelloTalk is a popular language learner app which helps you to learn a new language and can make pen pals. It allows you to chat, speak & learn foreign languages without the help of any tutor. One of the best features of this app is to allows you to practice your target language with native speakers via text/audio messages. You can quickly start free audio and video call with your friends. The application can be used even without the knowledge of languages, to chat with different people around the world. The service offers different transliteration and translation functions. Use Moments to share and ask questions about language, culture, or travel for all native speakers to see and comment. It’s not entirely a pen pals app, but you can use it to make pen pals with photos. 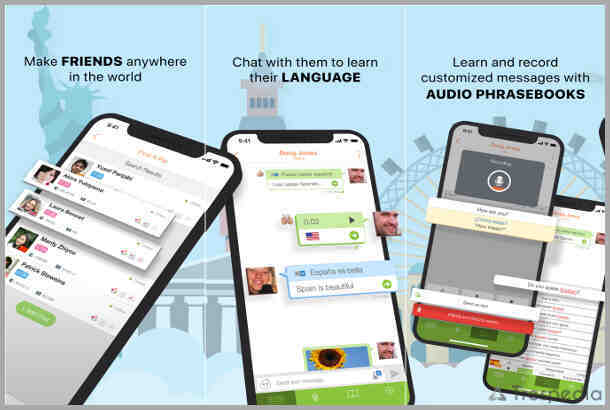 Tandem helps you to learn and speak any language with your pen pals easily. Register an account so that you can quickly learn a language online or offline. Along with these, it allows you to share topics with our learning community to find partners that share your interests. With Tandem meet people from different countries who will help you to understand foreign speech well and speak fluently yourself. 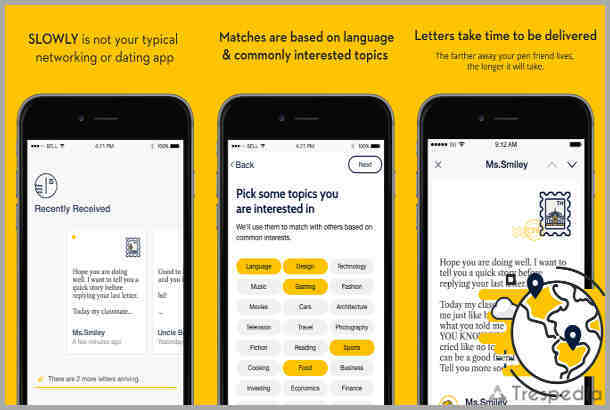 This app enables you to find a real international interlocutor, a pen pal, with whom you can practice in the language you are learning. Currently, more than 3 million users in the application are registered, so finding a character that is suitable in terms of age and interests is not at all problematic. There is also an opportunity to choose your interlocutor and start to live communication with him. For this, you can use audio and video calls, as well as text chat. When selecting a companion, it is better to choose those who study your language so that you can establish a mutually beneficial exchange of knowledge. In this way, interest in classes will be on both sides. Replika is an Artificial Intelligence. Yes, Its an AI which came out to be very much human and a great pen pal. If you are feeling low and want to share your feelings with, then try this app. I’ve played with many chatbots, and this is so immensely superior to all of them. It is a great pen pal app developed by Luka, Inc for Android and iOS users. 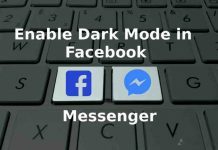 You can quickly start a chat in safe mode using this app and start talking about whatever is on your mind with Replika. Along with these it also helps you to easily explore your personality and get to know yourself better with every conversation. Replica also remembers things which you have told it earlier and keep that private. Download app from the link below. Airtripp is another pen pal app which allows you to meet global friends and chat with foreign friends. This app lets you make global friends from 250 countries and regions with ease. Along with these it also helps you to find language study partners and learn different languages for free. You can also find travel pal and create your travel plan and get advice from people all over the world. App also let you see and share pictures of different places. Other users can also like the pictures you are sharing of different places and can follow your profile. Follow others to know what they are upto. It is available for free as well as an in-app purchase option. 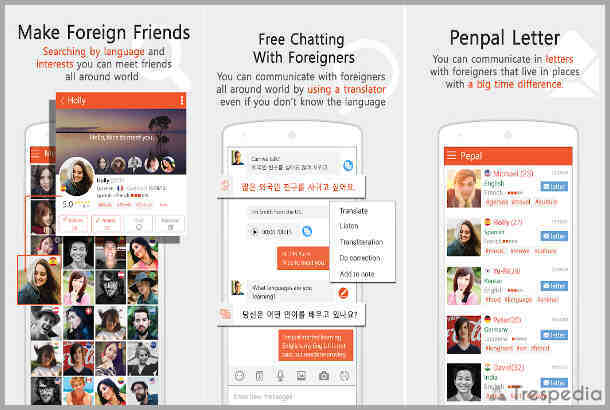 Hello, Pal is a great language learning app but will let you find a pen pal too. It allows you to talk to the world for free just like other apps. You can easily make new friends around the world and start to chat with them. Hello, Pal boasts a friendly interface and extensive functionality. It has listed more than 30 different languages which help you learn the language and to get you to start communicating via chat. You can also use the best font style apps and send the designed font to your pen friend using this app. Along with these, it has more than 2,000 ready-made phrases and sentences with audio guide. Hello, Pal is a free and very progressive social service, thanks to which users from all over the world can communicate with each other. The application is suitable for users who are already fluent in foreign languages, as well as beginners, who possess only minimal knowledge. Communication with other users takes place in an exclusive chat room equipped with an integrated online translator and a phrase book. Also, the application not only displays phrases on the screen but also knows how to voice them at a healthy and slow pace, thereby allowing the user to hone pronunciation. Moreover, the program after recording enables you to listen to the phrase, and if necessary, re-record it. There are 11 downloadable language packs, a game test to test knowledge, search for the most appropriate interlocutors by filtering by various parameters, including the languages studied, gender and age. Speaky is more of a language learner app than a pen pal app. 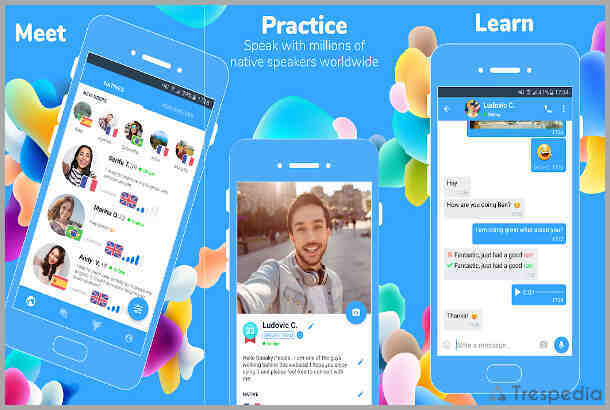 This app lets you instantly practice languages with people around the world. And here’s the part where you can chat directly with the other users. You can easily find a perfect language partner and learn from each other by merely exchanging your language skills. Along with these, you can also help a person who wants to learn your native language. 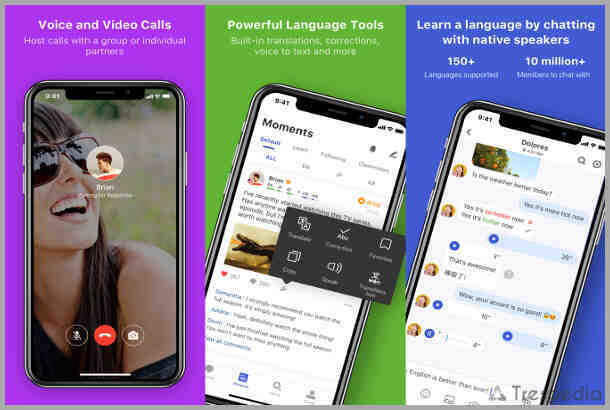 The interface of the free application is similar in appearance to the Skype program environment, but in Speaky there is no need to search for a carrier for a long time, willing to help you with foreign language practice for free. The built-in error analyser will help to correct the grammar and will tell you how to build sentences correctly. Those who want to help foreigners to learn a language can try themselves as teachers. Help those who wish to practice your language or find a pen-friend, learn new and useful things every day. The best thing is the app is completely ad-free and free of cost. AnyGram is a popular app which allows you to make global friends and start a chat with them. This app will enable you to learn a foreign language and culture with the help of an inbuilt translator. The app is useful if you don’t know the receiver’s native language and can easily use a translator to communicate. Apart from the translator, it has other cool features too. You will get sentences that are used frequently in 23 different languages to start. If you are having trouble with any language, native people from around the world can correct your sentences if you want to. It is a convenient service, thanks to which you can find pan pal friends from abroad, can get to know them and improve your knowledge in a foreign language. Block the annoying person if you want to from the options. Yubo is just like Tinder. You have to swipe right if you want to meet or chat with that person or left if you don’t want to. But it can be a used as a pen pal app which allows you to meet the world. 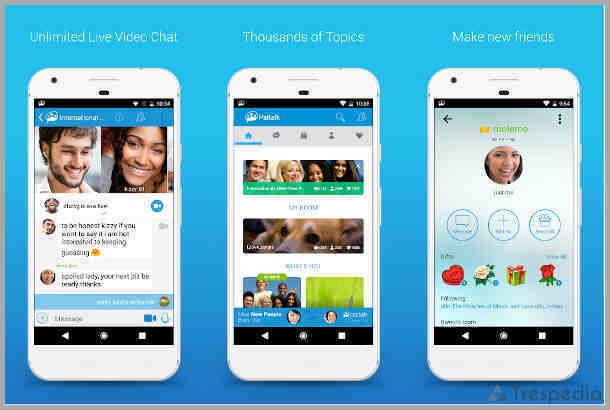 It is a perfect social networking app which allows you to make new friends nearby easily. It provides one to one chat option so that you can chat online with your new friends in a private conversation. Send and receive pictures and Bitmoji stickers with Animoji apps. Go live with up to 10 people at the same time. 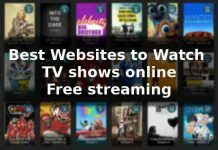 Livestreams are a public and unlimited number of watchers can see it. 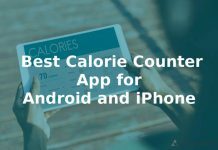 This app is available with both free as well as an app to purchase option with different features to us. 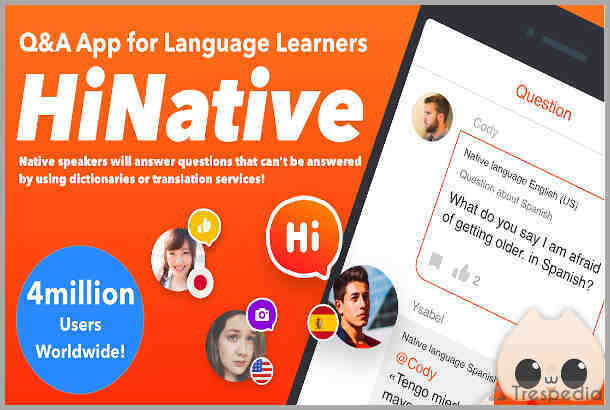 If you are not yet ready for direct conversation and correspondence, then HiNative service will be the best choice for communication with native speakers. It offers a less stressful for someone format question-answer. You can immediately ask a dozen other users who know the language you need. Connect with native speakers from over 170 different countries. Questions can be formed using ready-made templates if necessary supplementing them with images or audio recordings. The latter will evaluate your pronunciation and correct it, if necessary. Hit me up is a fascinating chat that connects you with people from all over the world. 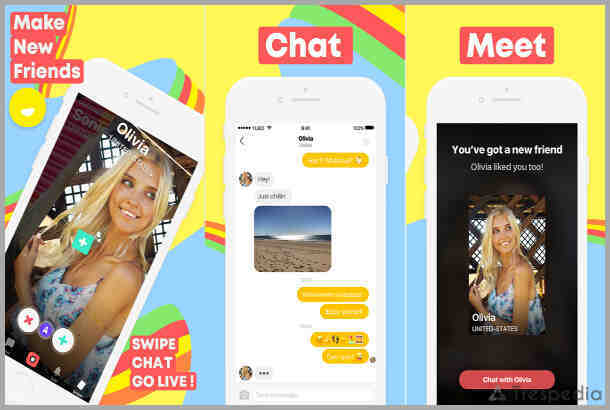 And if you are looking for an opportunity to meet new people with your smartphone, without revealing your phone number, then this application is ideal for you. Hit me up; you can create a profile that reflects your character and encourages other people with similar interests to communicate with you. You can add your photo with a brief description, indicating your age, country of residence, and gender. Hit me up works very simple. The application is designed to communicate with a variety of people. The first tab is a list of all people online at the moment or recently existed online, and you can start to communicate with them. In the second tab will be all your chats. Contacting other users is easy; start chatting with them. And also, if you find it difficult to decide who to talk to, you can automatically send a short greeting to ten people. That’s all for pen pals apps for Android and iOS. I hope you have started sending a letter and making friends. If you think this article can be improved, then we will love to hear from you either by comment section or by Contact us form. Do you think pen pal apps are helpful and bring out the traditional experience? Let us know about your views and issues from the comments section below. Get the best out of your smartphone, computer in the digital world. You can search for Android, iOS, Games, WordPress, Tips, Tricks and much more.